Smoking by teens has declined to record-low levels, according to the latest University of Michigan annual Monitoring the Future Study, which examines youth tobacco, alcohol and drug use in 2013 (data tables here). 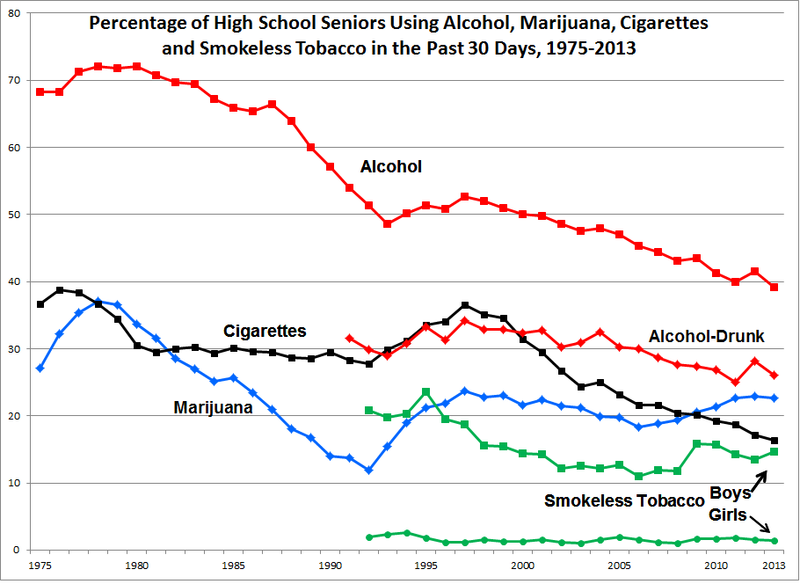 The figure at left, which shows the percentage of high school seniors using alcohol, marijuana, cigarettes and smokeless tobacco in the past 30 days over the period 1975-2013, is highly informative. Cigarette use continued a long-term decline, reaching 16.3%, the lowest prevalence since the survey’s introduction in 1975. Cigarette use was lower than marijuana use (22.7%) for the fifth consecutive year. Smokeless tobacco use among boys was 14.6%, and among girls 1.4%. Frieden’s speculation was based on data from the National Youth Tobacco Survey in 2012, indicating that 0.054% of high school students in the U.S. used an e-cigarette at least once in the 30 days prior to the survey and had not smoked or used any other tobacco product. Of the nearly 15 million high school students in the U.S., that’s about 8,000. Meanwhile, about 1.8 million students smoked. Smoking prevalence among high school seniors has declined every year since 2007, about the time that e-cigarettes were introduced in the U.S. With numbers like this, it is unlikely that e-cigarette use has contributed to teen smoking. Interesting how the CDC can condemn our youth based on 1/2 of 1% of the group. Did they reveal the nic level that the youth vaped? Nicotine levels can be as high as 36 mg/ml, but normally are 24 to 0. I'd wager a large percentage were vaping 0 nic.